Derek Rodgers is the current F-TR World Champion AND the reigning King of 2 Miles. He’s also a member of the Berger SWN-winning McMillan F-TR team. But when it comes to rifles, competition is only one of Derek’s interests. He’s also an avid hunter. He enjoys getting out in the back-country in his home state of New Mexico. Recently Derek went coyote hunting with his daughter, Dereka. They spotted some ‘yotes, but the real treat was seeing Oryx, a long-horned species native to Africa. Some time ago, a herd of Oryx was transplanted to a “secret spot” in New Mexico not too far from Albuquerque. Permission to hunt the Oryx is hard to obtain, but possible. Derek and his daughter could not shoot Oryx on this occasion because the timing wasn’t right. But he noted: “Calling for coyotes can get exciting when your daughter has an oryx hunt just weeks away.” You can see the animals in the video below. Derek says: “It would have been a successful morning if this was March 1st [when Oryx hunting would be allowed with her tag].” Derek’s wife Hope tells us that “Oryx meat is delicious — much better than deer or elk.” Good luck to Dereka and her famous father next month. Derek’s Coyote rifle (for this trip) was an AR-platform rig. Despite being a world-champion F-Class shooter, Derek had a number of coyote misses on this trip, which did NOT impress young Miss Dereka. It just shows that even the best can easily miss on a moving target. Share the post "The King of 2 Miles Goes Hunting with His Daughter"
Want to see the best semi-auto pistol and revolver shooters on the planet in action? Then check out Shooting USA TV later today. Today’s broadcast features in-depth coverage of the 2017 Bianchi Cup. Shooting USA’s John Scoutten and Julie Golob report from the NRA Action Pistol Championship, better known as the Bianchi Cup, after one of its founders, John Bianchi. NOTE: Shooting USA is listed as a one-hour show in your cable menu. 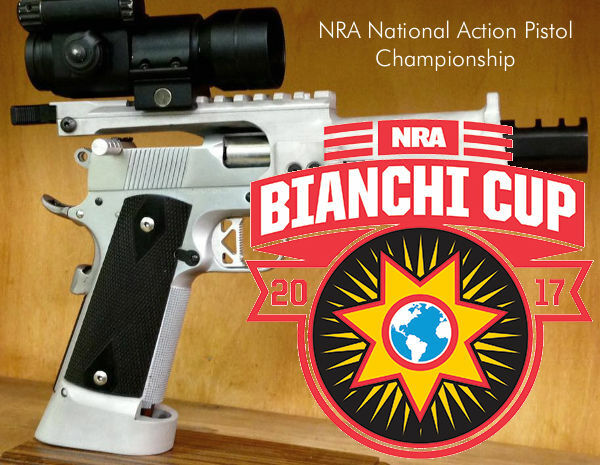 In the past 30 years the Bianchi Cup has become the richest handgun event in the world, with cash and prizes for the best scores on four stages of fire. Shooting USA will spotlight top male and female Bianchi Cup competitors in both wheelgun and and semi-auto pistol divisions. Along with North American shooters, the Bianchi Cup draws top handgun competitors from around the globe. In 2017 shooters from as far away as Australia, New Zealand, and Japan traveled to Columbia, Missouri in search of the perfect 1920 match score. Each round is the aggregate of the four (4) fired events: Practical, Barricade, Falling Plate, and Moving Target Events. Each of the four events requires 48 shots to complete. 480 points possible on each event. Three of the four are scored on the NRA tombstone P1 target. You must hit in the 10-ring or inner X-Ring on EVERY shot to shoot a “clean” 1920. 27 Years ago Doug Koening set the standard with a 1920. Since then, every Open shooter knows that he or she must “clean” this match (i.e. score a “1920”) to have a chance to take the title of “Champion”. The X-Count is the tie-breaker. Share the post "World’s Best at Bianchi Cup — NRA Action Pistol Championship"
The Civilian Marksmanship Program (CMP) invites young men and women shooters to apply for CMP scholarships for the 2018-2019 school year. The CMP offers $1,000 one-year scholarships to current high school seniors. Since 2005, CMP has awarded over $1 million in scholarship grants. Last year, the CMP received a record-setting number of applications and awarded over $150,000 in scholarship money. Winning scholarship recipients came from JROTC programs, 4-H groups and other shooting clubs. CMP Scholarships are based on merit. Selected individuals arehigh school seniors who are currently enrolled in a team or club that is participating in rifle or pistol marksmanship competitions. Applicants must provide rifle or pistol competition history, list of awards, and future goals in the shooting sports. Applicants must also provide academic GPA and an official high school transcript (3.0 Minimum GPA Required). The CMP is now taking scholarship applications for the 2018-2019 freshman college year. Scholarships are one-year awards that may be used to fund any accredited, post-secondary education or vocational program. (Note: Students planning to enroll in a military academy are not eligible). CMP Scholarship Regulations | 2018-2019 Scholarship Application Form. The deadline for CMP Scholarship Application is March 20, 2018. Learn more about the program at the CMP Website Scholarship Page. If you have any questions, please contact Kathy Williams at 419-635-2141, ext. 709, or email kwilliams [@] thecmp.org. Share the post "CMP Offers $1000 College Scholarships to Young Shooters"